Click the picture for a detailed image of the letter. Another busy season has passed us here at Mercury Graphics. We wanted to let you know we really appreciate all you do for us at Mercury. 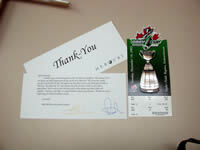 The Grey Cup trophy proved to be the best so far! 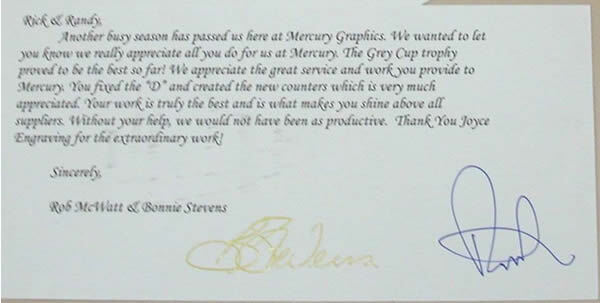 We appreciate the great service and work you provide to Mercury. You fixed the "D" and created the new counters which is very much appreciated. Your work is truly the best and is what makes you shine above all suppliers. Without your help, we would not have been as productive. Thank You Joyce Engraving for the extraordinary work! Rob McWatt & Bonnie Stevens"